RPE conjugated Goat anti Mouse IfF antibody recognizes both the heavy and light chains of mouse IgG.  The reagent has been adsorbed to minimise cross-reactivity with rat immunoglobulins and is therefore of particular value in detecting mouse primary antibodies bound to rat tissues. We recommend diluting this product in buffer containing 10% normal rat serum to remove any remaining cross-reactivity. Antisera to mouse IgG were raised by repeated immunisation of goats with highly purified antigen. Purified IgG prepared by affinity chromatography. Rao, W.H. et al. (2000) Potent costimulation of effector T lymphocytes by human collagen type I.
J Immunol. 165 (9): 4935-40. Rópolo, A. et al. (2001) Diminished percentage of antigen bearing cells in the lymph nodes of immune aged rats.